A rare photo of Selina Gray, Gen. Robert E. Lee's house slave, found on Ebay. WASHINGTON — Selina Gray was a trusted member of Gen. Robert E. Lee’s household. She looked after the famous Arlington House when the Lees fled as union soldiers advanced. She wed her husband in the same parlor as the famous general and his wife. She was also their slave. Now, a rare photo of Gray adds to the already complex picture of this woman who was eventually freed and whose descendants remain in the area today. The black and white photo shows Gray and two girls, possibly her daughters, posing outside her families’ quarters, located just a few feet behind Arlington House. Gray and her husband, Thorton, lived in the small room with their eight children. A second generation slave, Gray developed a close relationship with Lee’s wife, Mary Custis. When the Civil War broke in 1861 and the Lees were forced to leave Arlington, Gray was given the keys to the house and asked to take care of it until they returned. She is credited with saving many valuable artifacts, including items that once belonged to President George Washington, Mary Custis Lee’s grandfather. “Gray was a very pivotal but little known figure in our nation’s history,” says Lee Werst with the National Park Service. The house maid was so loyal to the Lees, in fact, that she personally approached union commander Gen. Irvin McDowell and urged him to remove the precious heirlooms before his soldiers stole them. Gray’s photo was accidentally discovered on Ebay by NPS volunteer Dean DeRosa, an amateur photographer and history buff. He was researching Civil War-era images when he stumbled upon the picture of Gray standing outside Arlington House. It was on sale for $700 by a person in England. The seller had acquired the rare photograph at a makeshift flea market in Kent. “I had seen a prominent photo of her from inside Arlington House,” he says. “She’s a little older in this one, but it is definitely her. The image was taken in stereo — a technique developed in 1838 that uses two photos placed side-by-side in a device called a stereopticon to create the illusion of depth. 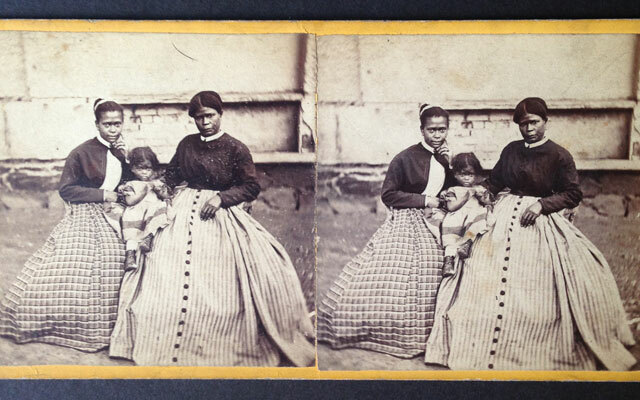 Stereo views were in vogue during the Civil War, but the photographing of slaves was not necessarily. At Arlington House, only one such photo exists. Gray’s picture will be unveiled Saturday at 2 p.m. at Arlington House. The event is free and open to the public.